Inverted roofs have their waterproofing layer beneath the insulation instead of above it as in other forms of roofing. In this issue the InvestigationsTeam explains how inverted roofs work, outlines their benefits, warns of a possible cause of problems and describes an unusual investigation. Inverted roofs are designed with the waterproofing layer, usually a liquid-applied membrane, beneath the insulation. Insulation boards are loose-laid on top of the membrane and then weighted down with paving slabs or gravel ballast. The great benefit of inverted roofs is that the insulation protects the membrane from extremes of weather, such as frost, UV exposure and the expansion and contraction that comes about from summer/winter temperature cycles, which can be as much as 80°C on some roofs. Rain that falls on the roof percolates through the ballast and between the insulation boards until it reaches the membrane. It then drains away through rainwater outlets. The build-up of the roof means that some water is almost always trapped beneath the insulation boards by capillary action. Consequently, the insulation is expected to be wet for the majority of its lifetime. This is taken into consideration when determining the U-value of the roof. Condensation risk calculations are carried out assuming that the membrane is on the warm side of the insulation. This is generally fine, but during heavy rainfall the membrane can become ‘chilled’ by the water that percolates through the ballast and insulation and then sits on top of the membrane. 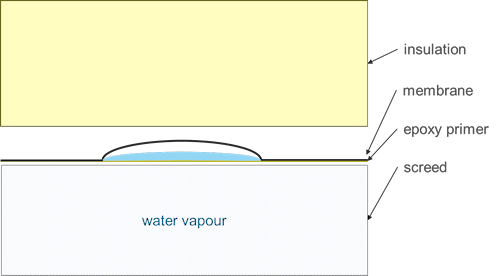 Eventually, the standing water will be warmed up by the roof deck, but until this happens, the temperature of the membrane may be below the dew point. This creates a risk that condensation could occur within the build-up of the roof. It is likely that, in the majority of cases, any condensation that occurs will evaporate once the membrane has warmed up, with no accumulation of condensate. However, in some circumstances it is possible for condensation to occur and to accumulate, leading to problems with the roof. BRE recently investigated a large building with an inverted roof that was suffering from persistent leaks, with water dripping from the underside of the roof and on to suspended ceiling tiles. When the insulation was removed from the worst-affected area, a large number of water-filled ‘blisters’ were found in the waterproof membrane (Figure 1). The blisters ranged in size from 50mm to 1m and further investigations revealed that they were present across the entire building. The building owners assumed that the blisters had formed because of pinholes and small tears in the membrane, and indeed many such defects were present. However, the majority of the blisters did not contain any defects and there appeared to be no path for water to enter them. 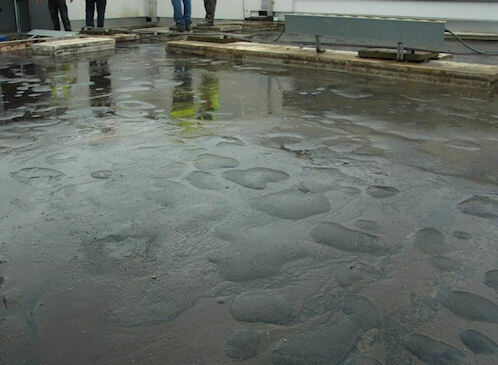 Following an investigation, BRE concluded that water that had been trapped in the roof build-up during construction had condensed between the top of the concrete screed and the underside of the membrane (Figure 2). The epoxy primer that had been applied to the top of the concrete screed appeared to be acting like a one-way valve, allowing water vapour to pass upwards, but not allowing it to be absorbed back into the screed once it had condensed. This caused the blisters to be ‘pumped up’ with water each time a sudden downpour followed a spell of fine weather. It is stressed that this was an unusual occurrence and not one that is normally associated with inverted roofs. Unfortunately the scope of the investigation did not allow BRE to fully investigate the circumstances that had allowed the blisters to form. But the most likely cause was a deficiency in the bond between the liquid-applied waterproof membrane and the primed surface of the concrete screed.